Wait, what's that smell? It's not just us, right? You're getting it too? Certain animals are known for certain characteristics. The giraffe, its neck. The elephant its nose. And the skunk? Well, of course it's known for what it does to your nose. Everyone knows that certain aroma that wafts through the air to let you know a skunk is near. Skunks don't bequeath their super scent just for fun, though. For them it's a defensive mechanism. But if skunks aren't worried? No spray! No spray, no problem (for your nose)! Honestly, aside from the concern of smell, skunks really are adorable with their fluffy little tails, bright beady eyes and tiny pink noses! Did you know that a baby skunk is called a kit? How cute is that?! They toddle around the woods minding their own business and only make a stink if something scares them (they even do a little warning dance beforehand)! They're essentially little black-and-white striped kitties. Who wouldn't want to dress up as this fuzzy little woodland creature? 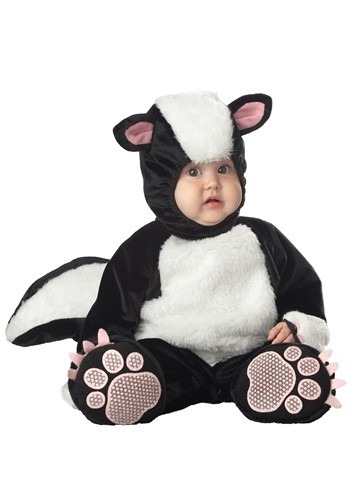 Our Who Done It Baby Skunk Costume is just the right choice for some little critters of yours... that may or may not have their own super scent powers. This costume has a soft fuzzy tummy, a snap on hood with adorable pink ears, and anti-slip paws for traction! It will easily add to your baby's adorable factor. Although, that smell? That's not the costume.